Swaraj 724 XM ORCHARD NT Narrow Track tractor price list in India with Mileage specifications features usable applications . 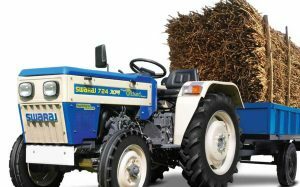 Swaraj 724 XM ORCHARD NT Narrow Track tractor information New price Specifications, how many HP does tractor have.price list UP Punjab, Bihar India. The price of Swaraj 724 XM Orchard NT Narrow Track Tractor in India is approx Rs. 4,18,078/- (Indian Rupees, Ex Show room Price). The price of this tractor in UP, Punjab, Bihar, Gujarat and other Indian states is almost same. see the Swaraj tractor latest model price list. The Swaraj 724 XM Orchard NT Narrow Track is fallen into 25 to 30 horsepower category tractor with 1824 CC. This tractor has smooth transmission system. It has fitted with powerful & fuel efficient two cylinders water-cooled engine. A feature included with Swaraj 724 XM Orchard NT narrow Track are power steering with separate steering oil tank, oil immersed brakes that offer better braking efficiency to the operator. Operators comfort, it is providing 6 forward and 2 reverse gearboxes, 12v 75Ah battery. Swaraj 724 XM Orchard NT Narrow Track can lift 1000 Kgs. Narrow rear track width and down draft silencer make this tractor very suitable for inter cultivation and orchard farm activity. Fuel capacity of this tractor is 40 litres. The width of Swaraj 724 XM Orchard NT Narrow Track is 1092 MM (43”) so it makes highly suitable for inter cultivation and Rotavation in orchard farm. Engine: Tractor is fitted with 2 cylinder fuel efficient water cooled engine. Down Draft Silencer: This design specially made for orchard farms so it will not foul with branches. Rear Wheel Width: Width of the rear wheel is 1092 mm so it helps when the operator is cultivating into corps. Deluxe Driver Seat: Driver seat feature of Swaraj 724 XM Orchard is very comfortable and has better suspension. PTO 540: It is suitable for PTO driven applications like a sprayer, rotavator, cultivator etc. Adjustable Check Chain: It helps to sway of implements and prevent crop damage during cultivating, rotavating etc. With Rotavator 724 XM orchard NT Narrow Track tractor is generating more power so farmers can easily rotavate into corps. With 540 PTO RPM, It is suitable for PTO driven applications like sprayer. Standard Power steering for better manoeuvrability & comfort to the operator.